Student is excited when he finds an intriguing, buried stone tablet with mysterious and ancient-looking writing. Expert laughs and says it looks like the cuneiform fairy is at it again. What would you think if you found this atop a mound in a Madison park? UW·Madison student Tom Leary, who found this recent artifact in Quarry Park on the West Side, took it to an archaeologist to find out. When UW-Madison student Tom Leary was brushing back leaves and sticks in Madison’s Quarry Park on a Sunday earlier this month, he was trying to create a better mountain bike route over the rough terrain. Instead, he was stunned by what he found on top of a rocky mound. It was a small, coffin-shaped stone tablet covered with strange, symbolic writing. Leary, 21, went home to Sun Prairie and began trying to look up the symbols in a book about Hopi Indians. He said he was worried about finding the correct tribe so he could return the artifact. Those worries evaporated when he carried it into the office of state Archaeologist Bob Birmingham. Birmingham said the piece was probably evidence that Madison’s “cuneiform fairy” was back at work. The mysterious artist got that name in 1994, when one of Birmingham’s colleagues put out a newsletter alert. Back then, excited people started turning up in archaeologists’ offices holding small clay tablets incised with symbols. They found them in the woods of Picnic Point and across Lake Mendota near Governor’s Island. Like Leary, the finders thought they had something really old. Instead, they had found evidence of a strange modern being that UW-Madison archaeologist J. 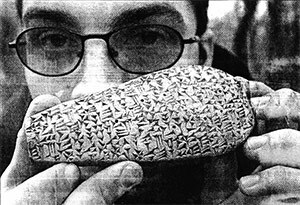 Mark Kenoyer dubbed “the cuneiform fairy” in the 1994 newsletter alert. When he’s not teaching in Madison, Kenoyer digs for artifacts in Afghanistan. He can also translate the Ugaritic cuneiform alphabet, which was used in Syria in the about 1500 B. C.
Back in the early 1990s, the tablets were smaller, Kenoyer said – more the size of a Tootsie Roll. But recent ones are larger and coffin-shaped. Kenoyer said that a student had recently brought him a stone similar to the one Leary found, but that he hasn’t yet had time to translate it from the Ugaritic. His theory has been that someone is having fun and that it could be a learning experience for anyone interested in trying to decipher the symbols. Leary has already spent some time staring at the stone. When he looks at it, he sees “guys with demented faces with dreadlocks and feathers” and plant symbols. He says he’s relieved that he hadn’t disturbed some ancient, sacred site. And while it was fun when he felt like Indiana Jones, it was also nerve-wracking, said his mother, Mary.